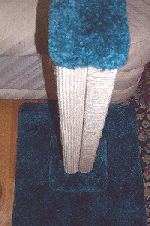 SW3 - Heavy, All wood, 30" sisal weave scratching post. Has reinforced base. Shipped with base off. Easy attachment with no additional tools necessary. Comes in earth tone, green, or blue. Save now by adding matching spare column for only $95.00 with no added shipping. If ordering two complete posts for $299, please find the SW3 TWO-PACK and order that. NOTE: To avoid shipping delays, please select the appropriate zone for your state from the drop-down menu.